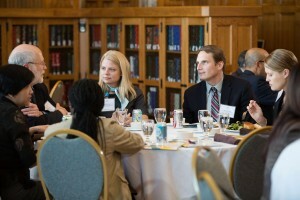 On a recent Wednesday evening in Plummer Hall, 14th floor of the Plummer Building in Rochester, Mayo Clinic physicians and scientists from many departments gathered for discussion. Sitting under the portraits of Mayo’s founders and early leaders were present-day physicians and researchers who continue the Mayo Clinic tradition of collaboration. 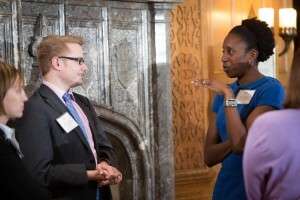 Hosted by the Mayo Clinic Robert D. and Patricia E. Kern Center for the Science of Health Care Delivery, this meeting provided a forum for building stronger relationships between varied specialties in clinical practice and research at Mayo Clinic. The location and day of the week for this meeting were significant. Starting in the early 1900s, weekly staff meetings for all Mayo physicians were held on Wednesday nights to review patient cases and discuss current articles in the medical literature. When the Plummer Building opened in 1928, the Wednesday night staff meeting took place on the 14th floor assembly room. In a 1933 note to meeting host Dr. Herbert Giffin, Dr. William J. Mayo requested that colleagues beyond physicians and dentists be able to attend – opening a wider door for collaboration. This tradition of physicians, scientists and others meeting across specialties formed the strong foundation of Mayo’s integrated care. 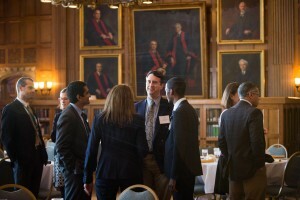 Continuing these traditions at the recent Kern Center meeting, it was appropriate that Dr. Jon Ebbert, the center’s Midwest associate medical director, spoke standing beneath the portrait of Dr. Augustus Stinchfield. In 1892, Dr. Stinchfield was the first physician outside the Mayo family who was invited into the practice. During the presentation, Dr. Stinchfield looked down on his great-great-granddaughter’s husband. We’d like to think he enjoyed watching the latest generation continuing an honored tradition from the earliest days. If you'd like to read more about Mayo Clinic history, visit our 150th Anniversary site. And if you're interested in visiting in person, and taking part in the collaborative conversation, register for Delivery Science Summit 2015.